lol, wonder if he takes practise swings? 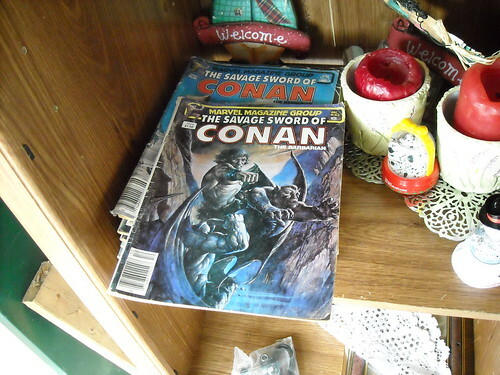 Spent the day browsing through the Flea Market at the Hocking Hills Market, found a stack of 80’s Savage Sword of Conan comics in a corner of one of the booths. These were definitely not collectors level as the spines were very worn and they had various tears and rips and yellowing. Decided to get one for nostaglia anyway, if it is in bad shape then I will not mind if it gets damaged from reading. I spent many an afternoon as a kid buried in Conan comics and Mike Grell’s Warlord from DC.